Oafan ship Ennesby stole from the Eina-afa space station 2014-03-13. Its hull is composed of PTU composites, making it extraordinarily dense and extraordinarily expensive. Neosynchronicity has a cluster of five forward annie plants, referred to by her crew as the NUSPI 2014-04-14, and a larger primary to the aft 2014-03-23. The NUSPI is an unusual gravy gun, using various rotations of phase to provide range instead of the focusing apparatus of a modern gravy gun. The halo caused by the out of phase effect has the side effect of irradiating the entire assembly, and this design costs about ten times as much as a modern gun, making it appear quite impractical. In fact, the NUSPI array is much more than an inefficient gravy gun; it is a weapon similar to the Credomar cannon. The five rotating gravy generators are used to tear a 1 cm wormhole from the weapon's muzzle to the target, through which it fires a beam of near-fusing deuterium. Unfortunately, firing the weapon expends the ship's entire fuel supply. Parked & preserved for millions of years, it has been put back into service for Tagon's Toughs 2014-03-30. It was destroyed during the battle of Dom Atlantis when the fuel supply normally used to hold together and spin down the NUSPI array was instead used to fire a second shot. The rotating array then tore itself, and the ship, apart 2015-03-02. Neosynchronicity first appeared on 2014-03-13 as the Toughs prepared to sell the rest of the Oafan ships at Parnassus Dom. [Insert uncertain and speculative facts about the vehicle.] Presumably to be one of the ships that migrated the Oafa onto the space station, that would put the ship's age at several million years. Hard to tell from the image on 2014-03-13 - does the ship say NSB03? So where are 01 & 02? Is Ennesby amassing his own fleet? 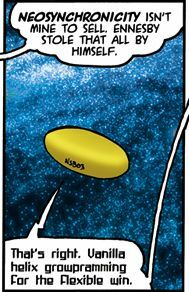 "Neosynchronicity" could reflect the PD Fleet, but for Ennesby (whose name is derived from the New Sync Boys - "N.S.B" - for which he was the A.I. pretending to be the boy band)... is he going to have multiple ships with the initials NSB? It's the third ship he's been the A.I. of. Also, "Neosynchronicity" means "New Sync."